The Happy Factory is having a dinner party and everybody is invited. It’s Gala time again! The 15th annual fundraising gala for The Happy Factory will be held Thursday, November 9th in the Ballroom of the Sharwan Smith Center at Southern Utah University at 6:00 PM. The Gala Dinner is the annual fundraising event of the Happy Factory and the broad community support is greatly appreciated by co-founder Donna Cooley. Southern Utah University is once again, a sponsor of the gala. We urge everyone to continue their support for the Happy Factory as it continues to make high quality toys for underprivileged and special needs children in Utah, around the country, and around the world. The Happy Factory is a non-profit charitable organization, founded by Charles and Donna Cooley who to date, has shipped well over 1,440,000 toys in the form of small cars and trucks. There are no paid positions at the Happy Factory. Time, materials, boxes, shipping, and almost everything needed to build a toy is donated to the Happy Factory. But that doesn’t mean there isn’t a huge need to raise funds. It takes a substantial amount of funds every year to keep the Happy Factory going. The Happy Factory also makes steam shovels for the developmentally disabled. The cars and steam shovels are not toys, but tools that can stimulate a child’s mind allowing them to think, become creative, and to cope with the world around them. The more than one million toys have been delivered to more than 125 countries, to schools, hospitals, family shelters, churches, foundations, and many humanitarians’ organizations around the world. Anyone can deliver toys during their travels. Many local individuals have carried toys to children in need. Many of these children never owned a toy or had anything else of their own before the gift of a Happy Factory toy. You can assist in continuing the mission of the Happy Factory by attending the Gala, sponsoring part of the evening, and/or contributing an auction item. You may also bring your skills to the Happy Factory and help make the little wooden cars that are filled with love. The annual Gala is always an excellent event; reminding us that we are truly blessed and giving us the ability reach out to help others, especially the children of the world. Many of the volunteers who donate time and talent will be in attendance. Take the time to discover how you can become a part of the Happy Factory family. Tickets to the Gala are $50 each or $400 for a table of eight. If you cannot attend the Gala then a donation of $100 to $200 will create a lovely gift basket that will become a part of the silent auction. Tickets to the Gala or a donation can be made by calling 435 586-8352 or visiting the Happy Factory located at 896 N 2175 West Circle in Cedar City. A member of the gala committee will visit your business. Auction Items will be sold in silent auction formats. Do you have an item or service you would like to contribute? Your generosity will be much appreciated. All local businesses and individuals that would like to contribute an auction item are encouraged to put something together and drop it off at the Happy Factory. These items are essential to the success of the Gala. Dinner Sponsor, with a donation of $2,500, will receive eight tickets to the gala, special recognition at the Gala and will treasure the blessing that comes from sharing. This contribution will cover many of the expenses of the evening to allow more of the evening’s contributions to go directly to the manufacture of the toys. They will also receive a matched set of cars and a steam shovel. 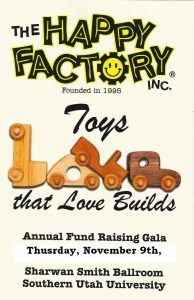 Steam Shovel Sponsors, with a donation of $1,500, will receive eight tickets to the Gala, recognition at the Gala, one steam shovel, and will understand the joy of being a benefactor to the Happy Factory allowing the creation of over 3,000 new toys. Matched Car Set Sponsors, with a donation of $1,000, will receive eight tickets for the Gala, recognition at the Gala, one matched set of toy cars, and will feel gratitude for allowing the making of over 2,000 new toys for children. Auction Sponsors, with a donation of $750 will receive four tickets to the Gala, recognition at the Gala and experience the joy of creating over 1500 new toys for children. Table Sponsors, with a donation of $400, will receive eight tickets to the Gala, and know the peace of participating in sending cars all over the world and the creation of 800 new toys for children. Thank you for considering The Happy Factory as a beneficiary of your time, effort and hard-earned money. You may also wish to volunteer to work at the Happy Factory. You can make a child’s life brighter in many ways. For more information on the Happy Factory call 435 586-8352 or visit www.happyfactory.org be sure to like The Happy Factory on Facebook.